Figure 12 Illustration of the "Biopharmaceutical Drug Disposition Classification System" (BDDCS), which classifies drug absorption potential identically to the BCS (Fig. 11) and incorporates the expected route of elimination and the anticipated role of transporters and food on the absorption process. Source: Based on information in Ref. 79. Courtesy of Saguaro Press. Class I compounds have both good solubility and permeability and generally offer no problems with regard to having a good absorption profile (e.g., acetaminophen, disopyramide, ketoprofen, metoprolol, nonsteroidal anti-inflammatory agents, valproic acid, verapamil). In general, one would not expect the presence of food to influence the absorption of this class of drug. The onset or rate of absorption may be delayed by the presence of food as a consequence of reduced gastric-emptying rate (Tmax, the time to maximal plasma concentrations, is increased), but the completeness of absorption should not be compromised (fraction of dose absorbed, F, is unchanged). Drugs in class II have low aqueous solubility (but high membrane permeability), and any factor affecting dissolution rate would be expected to have an impact on the absorption of such compounds. Factors such as fluid pH, volume and viscosity, and bile secretion (especially in response to fatty foods) might be expected to play a role in dissolution rate and thereby affect absorption. Compounds that fall into this class include carbamazepine, cyclosporin, digoxin, griseofulvin, and spironolactone. Food would be expected to exert a potentially significant effect on the absorption of the drugs in this class. The absorption of many compounds in this class is improved in the presence of a fatty meal (F increases). Improved absorption occurs because of the secretion of bile in response to fat and the surfactant and solubilizing properties that bile salts exert on poorly water-soluble compounds (griseofulvin is a classic example). The presence of food, especially fatty foods, will delay gastric emptying and intestinal transit, which in turn allow for more time for drug dissolution and absorption (Tmax is likely to increase). Many drugs in this class, however, are substrates for gut wall metabolism (especially CYP3A4) and efflux transporters. To the extent that food components may affect those functions, the effective mechanism(s) of any food effect will need to include consideration of those factors. Drugs in class III have good aqueous solubility but poor membrane permeability (e.g., bidisomide, bisphosphonates, captopril, and furosemide). Food and food components would only be expected to influence absorption of drugs in this class if they affected some aspect of membrane permeability or function or if the permeable form of the molecule was altered (e.g., through ionization). Many of these compounds tend to be absorbed in relatively well-defined and limited areas of the upper small intestine. As a consequence, the physical presence of food may affect the time during which the drug resides at sites of maximal absorption. Food and the viscous milieu that it creates in gut fluids may also create a significant physical barrier to the diffusion of the drug to sites of absorption along the GIT membrane. Several compounds that fall into this class illustrate reduced absorption in the presence of food (F decreases, Tmax increases), which may also reflect food component effects on any influx transporter. Class IV drugs have low aqueous solubility and poor membrane permeability and as such are often considered as poor drug candidates for oral administration. Other routes of administration may need to be considered. For example, neomycin falls into this category, and its oral use is to achieve sterilization of the gut. There is too little information about these compounds and the effect of food to offer general observations; however, solubilization and/or involvement of transporters are likely to explain any food effects. In examining factors that might offer quantitative, predictive rules for the effect of food (especially fatty meals) on drug absorption, several groups have reached some tentative conclusions. On the basis of a chemically diverse group of about 100 drugs (81), the investigators determined that the exposure ratio (AUCfood/AUCfast) was inversely related to (log) aqueous solubility and directly related to a (log) solubility ratio (dose/ aqueous solubility) and to (log) Ko/w. As others have observed, food effects are most pronounced for poorly water-soluble, lipophilic compounds. Another group, using regression analysis applied to a more comprehensive set of chemical variables (92 drugs), concluded that those variables permitted a correct categorization of a positive, negative, or no food effect 97%, 79%, and 68% of the time, respectively (76). In those instances associated with a positive food effect (i.e., increased F), solubilization appeared to be the primary factor (class II and perhaps class IV). A negative food effect (decreased F) appeared to be most associated with hydrophilic compounds that are absorbed over a defined length of the GIT (class III). A drug should always be ingested with a cup of water (ca., 8 oz) to insure easy transit down the esophagus and to provide fluid for disintegration and dissolution. Whether or not the drug should be taken on an empty stomach (e.g., enteric-coated tablets) or with food will depend on the specific drug. Drugs that should be taken with food include those compounds that are irritating to the tract (e.g., nitrofurantoin), those absorbed high in the tract by a specialized mechanism (e.g., riboflavin and ascorbic acid), and possibly those where the presence of certain food constituents are known to enhance absorption (e.g., griseofulvin). The absorption of griseofulvin (class II), which is a very poorly water-soluble drug, is enhanced when it is coadministered with a fatty meal as discussed previously (63,64). For those compounds that irritate the tract, perhaps the best recommendation is to ingest the drug with or after a light meal that does not contain fatty foods or constituents known to interact with the drug. Nitrofurantoin absorption is improved in the presence of food (82,83). Riboflavin and ascorbic acid, which are absorbed by a specialized process high in the small intestine, are best absorbed when gastric emptying is delayed by the presence of food (37,84). As the residence time of the vitamins in the upper portion of the intestine is prolonged, contact with absorption sites is increased and absorption becomes more efficient (i.e., saturation of transporters is avoided). The influence of food on the absorption of those vitamins is illustrated in Figure 13 along with improved efficacy of ascorbic acid absorption achieved by administering divided doses. Figure 13 (Top) Influence of food on the absorption of different doses of riboflavin. 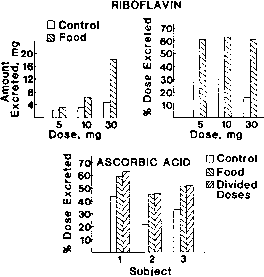 (Bottom) Influence of food and divided doses on ascorbic acid absorption in three subjects. Source: Based on data from Refs. 37 and 84.
gastrectomy. Muehlberger (85) noted that, following a near-total gastrectomy, patients often complain of "sensitivity" to alcohol. This is probably best explained by ethanol moving rapidly from the poorly absorbing surface of the stomach to the small intestine, where absorption is rapid. Food slows gastric emptying of ethanol, resulting in a slowed absorption, a greater first-pass effect, and lower plasma concentrations (86,87). Gastric emptying has been shown to be important in oral L-dopa therapy, and it has been noted (88) that patients with a partial gastrectomy or gastrojejunostomy exhibit a prompt response with less than average doses of the drug. This observation is consistent with rapid absorption from the small intestine in such patients and is essentially equivalent to introduction of the drug into the duodenum. For many drugs, as has been shown for acetaminophen, there will be a direct relationship between gastric-emptying rate and maximal plasma concentration (Cmax) and an inverse relationship between gastric-emptying rate and the time required to attain maximal plasma concentrations (TTmax). Those relationships are illustrated in Figure 14A and B (89). Also shown in Figure 14 is the influence of a narcotic (heroin) on the gastric emptying and absorption of acetaminophen (Fig. 14C, D) (90). In attempting to predict such relationships, however, it is essential that one consider the physicochemical characteristics of the drug. While increased gastric-emptying rate will probably increase the rate (and possibly the extent) of absorption for drugs best absorbed from the small intestine from rapidly dissolving dosage forms, the converse may be true in other circumstances. For example, if the dosage form must first be exposed to the acidic gastric fluids to initiate disintegration or dissolution, rapid emptying may reduce the rate and extent of absorption (e.g., ketoconazole, a basic compound). Similarly, if the drug dissolves slowly from the dosage form, a shortened residence time in the gut may reduce the extent of dissolution and absorption. One needs a good deal of fundamental understanding of the chemistry of the drug, its dosage form, and the absorption mechanism before being able to anticipate or rationalize the influence of these various factors on the efficacy of absorption. 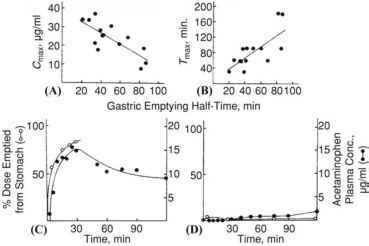 Figure 14 (A,B) Maximum acetaminophen plasma concentration (Cmax) and time to achieve that concentration (Tmax) as a function of gastric-emptying half-time. (C) Percentage of an acetaminophen dose emptied from the stomach (o-a) and acetaminophen plasma concentrations (•-■) as a function of time in one subject. 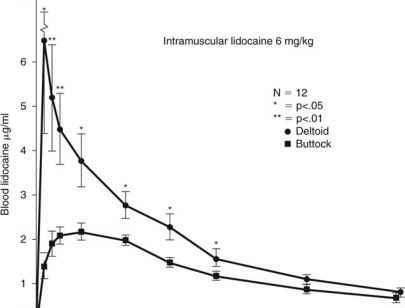 (D) The same plot and for the same subject as in (C) after a 10-mg intramuscular dose of heroin. Source: Parts A and B from Ref. 89 and parts C and D from Ref. 90. A final point that should be mentioned here, although it has received relatively little attention, is that of esophageal transit. Delay in movement down the esophagus will delay absorption and, in addition, for certain drugs, may also cause local mucosal damage. Capsule disintegration has been observed to occur in the esophagus within three to five minutes. Esophageal transit is delayed when solid dosage forms are swallowed with little fluid or when the subject is supine (91,92). Antipyrine absorption from capsules (93) has been shown to be delayed when esophageal transit was prolonged. To avoid this delay the dosage form should be swallowed with water or other fluids, and the subject should be in a standing or sitting position. This appears to be especially true for the drug class used for treating osteoporosis, bisphosphonates, which must be ingested with adequate fluids while the patient sits in a chair to avoid potentially serious esophageal erosion.